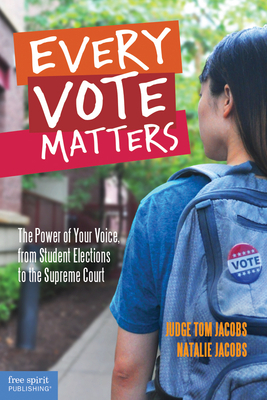 Encourage teens to recognize the importance of voting and making their voices heard in the democratic process with this timely book focused on Supreme Court decisions that came down to a single vote. Chapters examine key Supreme Court rulings and explore how these cases have affected the lives and rights of U.S. citizens—especially teens. Using a straightforward, impartial tone, the authors take a close look at often controversial cases and at the history of voting in the United States. The emphasis is involvement in local and national elections as well as other ways to be an engaged citizen. With an accompanying digital discussion guide, the book is a perfect choice for teachers and youth leaders to offer teens in the upcoming 2016 presidential election cycle. Judge Tom Jacobs has served as an Arizona assistant attorney general, a Superior Court juvenile division judge, a family court judge, and an adjunct professor at the Arizona State University School of Social Work. He is also the author of What Are My Rights?, Teen Cyberbullying Investigated, and They Broke the Law—You Be the Judge. Judge Tom lives in Arizona. Visit his website at AsktheJudge.info.